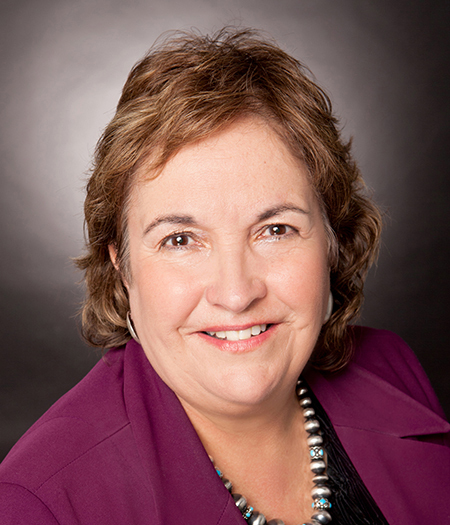 Patricia Montoya, MPA, BSN, RN, is the Executive Director of the New Mexico Coalition for Healthcare Value, a not for profit, employer led multi-stakeholder organization focused on healthcare value (a business health coalition). Pat has over 40 years in the health care field ranging from direct patient care, public policy, management, and leading healthcare innovation. She is a 2003 graduate of the Harvard John F. Kennedy School of Government State Health Leadership Initiative and is a graduate of Leadership Albuquerque. She has served on numerous boards and committees, including Con Alma Foundation, the Catholic Health Initiatives (CHI) Board of Stewardship Trustees Quality and Safety Committee, and the Robert Wood Johnson Foundation Nurse Fellows National Advisory Committee. She currently is Vice Chair of the Presbyterian Central New Mexico Board of Directors. Most recently she was named one of 27 ‘Women of Influence in New Mexico” by Albuquerque Business First. She is a native New Mexican, a registered nurse and a graduate of the University of New Mexico with a bachelor’s degree in Nursing and a master’s degree in Public Administration/Health Administration. In her spare time Pat enjoys reading, watching movies and traveling with her husband Al. The New Mexico Coalition for Healthcare Value is an employer-led, non-profit, multi-stakeholder coalition working to improve health and maximize the value of healthcare services in the state. The Coalition supports and brings together employers, health plans, providers, health support organizations and state leaders to align their efforts to more effectively improve the quality, transparency and cost of healthcare. For several years, the Coalition has provided respected, non-aligned and popular forums for stakeholders to come together, share information and “best practices,” find areas of common agreement, and make decisions about mutually-beneficial actions to bring about meaningful change in our health system. U.S. Domestic Medical Travel (USDMT): How did you get involved with the New Mexico Coalition for Healthcare Value? Patricia Montoya (PM): I actually became the executive director of our coalition since its inception three years ago, when we transitioned from the Robert Wood Johnson Foundation funding for Aligning Forces for Quality Initiative. We established the new not for profit. I am a nurse by background, with 43 years in healthcare, so I come to this position with a very different lens. My clinical background helps me understand the delivery system and payment piece probably in a different light than most of our current coalition directors. This is helpful because we have very different challenges in health care in the state of New Mexico. I have always strived to innovate and be a catalyst for change in my health care career. While I’ve worked in various hospital settings, including the ER and outpatient urgent care, early on I got interested in figuring out how policy and politics affects healthcare. This led me to become a political appointee under President Bill Clinton’s Administration serving at Health and Human Services under Secretary Donna Shalala and then I was the Secretary of Health in New Mexico for Governor Bill Richardson from 2003-2004. Aligning Forces for Quality was an initiative under the Robert Wood Johnson Foundation and they began funding us in New Mexico in the spring of 2009. We received funding for six years, and we were charged to work in a multi-stakeholder coalition with those who pay for care – employers and health plans, those who provide care – physician groups and hospitals, and those who receive care – consumers. We started pushing for transparency as it related to quality and we began creating the dialogue on payment reform by bringing together stakeholders for the common vision of improving quality, transparency and access while decreasing cost. Currently through the coalition we have about 200,000 covered commercial lives out of a state with two million population, which gives us some leverage. USDMT: Do you purchase benefits as a coalition? PM: No, but we do a lot of educational summits driven by our employers. We focus on where they are and what they need at that point in time. Our employers drive our agenda. I believe we have a great impact and access at the state level. In a state like New Mexico we can more easily create bridges and we are able to talk with the Medicaid director so that we might see how we can leverage and align the private/commercial market and Medicaid system since 40 percent of our state’s population is covered under Medicaid and we have been a Medicaid managed care state since the mid-90’s. If we can drive 20 percent of the commercial market and through Medicaid we can drive 40 percent of the Medicaid market, we can create real change in New Mexico as far as where and how healthcare is provided — and impact quality and cost. USDMT: Give us an overview of activities. PM: This is the core of what we do: help employers, health plans and providers align efforts to improve the value of healthcare services through shared learning opportunities and pushing for transparency. We’ve had successful seminars on: depression in the workplace, CMS initiatives on knee and hip replacements, rising pharmaceutical costs, and employers’ roles in diabetes prevention and management. Last fall we convened a “Summit” around heart failure and we brought together the major cardiology groups throughout the state to see if we can start developing a road map or a blue print in New Mexico as it relates to cardiology. Again, this was based upon the need and the interest from our employers. We also provide tools for employers to be able to evaluate the different health plans as they decide with whom they are going contract with for their healthcare benefits. One of these tools is the Employer Guide to Managed Care. It provides a side by side comparison of our major health plans in the State, utilizing their Hedis data on measures that the employers have selected. USDMT: What types of businesses participate in the coalition? PM: As our coalition continues to grow, we are continually reaching out to large and small public and private employers and other stakeholders to join us. We are multi-stakeholder so we also have all the major health plans, as well as representatives from the delivery system at our table. We invite everyone so that members can identify opportunities and align efforts that drive meaningful change. We provide a neutral forum for public and private partners to share best practices, give members access and exposure to national industry experts and thought-leaders in health benefits, procedures and policy and help them stay current on policy change, benefit plan designs, and strategies to improve employee health and wellness. USDMT: Are the employers all self-insured? PM: Many of our large employers are but not all of them are self-insured. USDMT: Do they offer a domestic medical travel benefit? PM: Not that I am aware of at this time. USDMT: Are you familiar with North American Specialty Hospital(NASH)? They offer high quality clinical care in Cancun at their Center of Excellence (COE). PM: I am not familiar with them I am interested in learning about them because I am a firm believer that to move the status quo, we need that kind of disruptive innovation. I understand the delivery resistance from the providers given their challenges and risks. At the same time, I can also see that there’s been opportunities that we haven’t taken advantage of, and know that the current system is not working at least not for everyone… So that’s how we start to bring people together to talk about how to do things in a different way. USDMT: So, medical travel is worth a conversation. PM: I’m always interested in bringing those innovations or disruptions that we may not have heard about to our folks and allow them to make decisions about opportunities they might otherwise not know about.